I started reading books on paranormal topics during my early teen years, and I can honestly say that over the past three plus decades I cannot remember when a book of this genre has moved me to tears. At least that was the case up until last week when I had the pleasure of reading D.J Turk's Surrounded By Spirits: Visitors From Beyond. Dorothy's (the author's full given name) book goes far beyond an average collection of ghost stories, and serves more as an autobiography that includes several encounters with ghosts and haunting activity. Dorothy's book takes us through her formative years growing up with her brothers in rural Ontario in the 1960s to the present day. Her journey is one that is filled with much love, and happiness, triumphs, and tragedy, as well as sorrow. As a very young woman we learn that Dorothy suffers with survivor's guilt over an accident that claimed the life of her boyfriend, close girlfriend, and her beloved younger brother. It was through this horrific tragedy that the author first has an experience that will eventually help to cement her belief that life, and love does go on beyond the grave. We as readers are invited to travel along with the author as she shares her life story with us, and that story is an intriguing one! It is very easy to identify with the author as a hard working Canadian woman, trying to live the best that she can (just like we all do) who on occasion throughout her life has what can only be described as some extraordinary experiences. Dorothy's writing style is easy, and in no way pretentious, making the reading of her book like having a good and riveting conversation with someone whose words you are hanging on because you are genuinely interested in what they have to say. As I stated above I have read many books of this genre including ones that are billed as "true" accounts of the paranormal. More often than not these "true ghost stories" read more like Hollywood fiction (think Amittyville Horror) and are quite predictable or at best leave you with the sense that they are either being embellished upon or sexed up in order to sell more copies, appeal to horror fans, and/or possibly garner a movie offer. And I am especially wary when said books are written by self-styled ghost hunters who are seemingly LARPing their favourite paranormal "reality" tv shows. What is so refreshing about reading Dorothy's account of her paranormal experiences, and what sets them apart is that they have a strong ring of absolute sincerity, and truth to them. In this book you will not find blood dripping from the ceilings, nor evil demonic forces chasing the family out of their home in the middle of a dark and stormy night nor anything else that smacks of a B horror film or Stephen King novel. What you will find is an honest accounting of experiences with the paranormal such as has been reported by people of various walks of life, and cultures over millennia. The author herself admits that while some of her encounters have been quite chilling especially as they were happening, over all, living in a "haunted house" was more annoying than anything else, particularly once she took the time to research the topic, and begin to conduct investigations of her own. Knowledge is definitely power, and I believe that others going through similar experiences would benefit from reading Dorothy's book. Much like this book might not appeal to a horror fiction fan, I am equally confident in saying I do not think it will change the minds of any sceptics or doubters. These are real experiences, but of course they are subjective to the experiencer as are the photos that the author has chosen to include in her book. 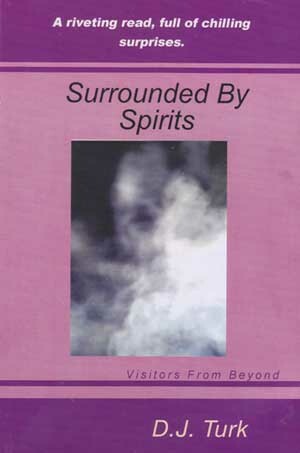 There is no "proof" within this book that will satisfy everyone that spirits of the dead interact with living people. However, this book should appeal to any serious researcher or student of the paranormal, including those with a strong interest in historical accountings of hauntings in the province of Ontario, Canada. It will also be of interest to anyone that enjoys reading personal ghost stories, and those who are open to the possibility that human consciousness survives bodily death. What I personally most enjoyed about Surrounded By Spirits: Visitors From Beyond is that it reinforces my own belief that no matter what the true cause of these encounters with the unknown they are in fact a very human experience, and perhaps just a natural extension of our own experience while on this plane so to speak. Well done Dorothy! I wish you success in all your endeavours, and I look forward to your next book.